The coalition of state law, Tuesday, March 27, 2018, that the federal budget for this year became effective with a deadline of 15 days and the ministries to work. "The budget is effective with the expiration of the 15-day period that was given to the president constitutionally, and without its ratification, it will take effect," Al-Sabah newspaper quoted MP Ali al-Alaq as saying. "The non-ratification does not mean challenging them, but there may be an amendment. "He said. The Information Office of the Presidency of the Republic was announced on March 13, 2018, rejected the President of the Republic Fuad Masum, the ratification of the budget of 2018 due to the presence of about 31 points where intersect with the legislation in force. "The President of the Republic Fouad Masoum decided to return the draft law of the general budget for the fiscal year 2018 and voted by the Parliament on the third of this March, to the House of Representatives to re-examine the form and content of the constitutional, legal and financial." A member of the parliamentary legal committee, Salim Shawqi, predicted on Tuesday, March 27, 2018, that the budget bill for 2018 will be published in the official gazette within the next two days. "The President of the Republic does not have the right of rejection of the federal budget, but he can give his opinion and observations around it, and if there are irregularities on it can be challenged by the Federal Court or settled with the House of Representatives. He added that "the remarks that came from the President of the Republic on the budget were mostly formative comments," continuing that "the Presidency of the Parliament announced that it paid the federal budget to the government for publication in the official newspaper which is practically the current time with the Ministry of Justice and expect to publish during the next two days. It is noteworthy that the House of Representatives voted, in its session held on Saturday, "March 3, 2018" on the federal budget for the current fiscal year by boycotting the Kurdish deputies. The 15 Days From When It Was Announced That It Would Be Published In The Official Gazette Has Just About Run Out ! So We’ll See If Shows Up In There Anytime Tomorrow Or If Was Just Some Kind Of An Elaborate Bluff ! The thing that amazes me is all of these thieving, hoarding, crooked politicians have taken their stolen monies and put them in accounts outside of Iraq (as in banks in other countries) .... Imagine if the numb nuts had of invested in great malls, museums, roads, electricity, and running water for the hotels they had built in Iraq...... What a bunch of stupid narrow minded nincompoops! They are just simply mind boggling!!! Thank you. I can go to sleep now and dream of cashing in my dinar. Good night!! MAN ! That made all kinds of common sense there jcfrag . . . and those greedy, selfish mutant screw head puss bags don't have a lick O common sense . . . mind boggling is right ! The Ministry of Justice announced the end of all checks for the publication of the budget law in the Official Gazette. "The ministry is in the final stages of preparing the special edition of the Official Gazette [the Iraqi facts], which will be published in the budget law of 2018 in the extension of the legal period and without the approval of the President of the Republic," Justice Minister Haider Zamili said in a press statement, As the Iraqi Department of the facts issued and each year a special edition of the budget law. " He added that "the Iraqi facts department in the ministry has completed all the textual checks necessary for publication and will be held a joint meeting with representatives of the Ministry of Finance to audit the tables listed in the law and according to the regulations of the publication of the budget law every year." The Presidency of the Republic has directed, on Thursday, to send the budget law for the year 2018 to the Ministry of Justice for publication in the Official Gazette. Sumer News: An official source said on Thursday that the Iraqi fact sheet will issue a special number of the law of the general budget. The source told (Sumer News) that the Presidency of the Republic sent the budget law to the Ministry of Justice for publication in the Official Gazette, explaining that once the budget is published in the Official Gazette, the budget has become valid and ratified. The source said that "the draft public budget law for 2018 is published in the Iraqi official newspaper on Sunday to be a legal window and enter into force." The source expected "the issuance of a special number of the fact sheet includes the publication of the budget law only in the absence of the readiness of draft laws and decisions for publication." Two official documents, addressing the Iraqi Ministry of Justice, one issued by the government and the other by the Presidency, showed escalating differences between the two institutions over the 2018 budget. The government document demanded the Iraqi Ministry of Justice to publish the general budget in the Official Gazette, so that it can officially start working according to Iraqi law. The Iraqi Presidency requested the ministry not to publish it because of objections from President Fuad Masum. The Iraqi parliament, last Tuesday, the federal budget law of 2018, to the President of the Republic for the purpose of ratification, without any amendments to the objections of the Presidency of the Republic. The Iraqi President Fuad Masum refused on 13 of this month, the ratification of the budget law, and returned to Parliament for the purpose of amending 31 paragraphs considered to be contrary to the law and the Constitution, without reference to those violations. "No one has the right to suspend the general budget of the country after a vote by the House of Representatives," Prime Minister Haider al-Abadi said. A rebalancing of the presidency without modification could trigger a crisis within the country as it may remain stalled despite nearly three months of the new year. Parliament approved on March 3, the budget, amid the boycott of the deputies of the Northern Region; in protest against the reduction of the share of the region from 17 to 12.6 percent. The budget is about 104 trillion dinars (about 88.1 billion dollars) with expected revenues of 91.6 trillion dinars (about 77.6 billion dollars) and a deficit of about 12 trillion dinars (about 10 billion dollars). The expected revenues from the export of crude oil were calculated on the basis of the average price of $ 46 per barrel and the export rate of 3.88 million barrels per day, including 250 thousand barrels of fields in the Kurdistan region of Iraq. ".....the draft public budget law for 2018 is published in the Iraqi official newspaper on Sunday to be a legal window and enter into force." I'm not crazy about the idea that Sunday is both Easter AND April Fool's Day. Sunday, besides being Easter in most places, is April Fools Day. I'd say that would be an appropriate day to officially enact the 2018 budget, given recent developments! I See It’s Ur First Post - Welcome DV StumpJumper ! President Davis Will Be Staggering In Later To Also Welcome U To The Mayhem ! Thanks Thug. Been holding Dinar since 2010.It's just been laying up in that safe just screaming to me to take it out do something with it LOL! Just because you get an official budget doesn’t mean there will be an automatic rv. I know. I'm just hoping that the "new and improved" numbers are in the budget. It is the end of the first quarter. They said the auctions would stop at the end of the first quarter. Elections coming up in May. Abadi wants to be re-elected. 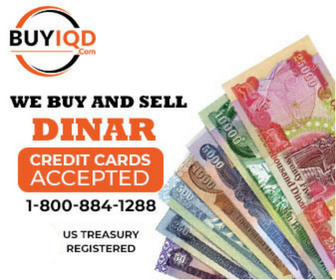 I remember that one of our posters (Handy, I think) said they stopped selling dinar at military bases last month. They are "fiddling" with the exchange rate on a bunch of sites. "Security Forces" from US and Israel in Iraq. So much happening that never happened before. Things do seem a lot diffrent this time around and that is for the good. End if 1st quater and time to get it on!!! Same to you. Make sure that when this hits we meet at tbe party.